Today is Friday, September 6, 1996. Start the weekend a little early with MOLONEY on Thursday nights this fall. Who's going to teach her professor some things when she goes back to school this fall ? LATE SHOW WITH DAVID LETTERMAN: Tonight's guests include comedian Adam Sandler, news anchor Brian Williams and singer LeAnn Rimes. LATE LATE SHOW WITH TOM SNYDER: Tonight's guests include bandleader Doc Severinsen and actress Beverly D'Angelo. E-mail questions to Tom and his guests at [email protected]. Starting today, CBS News brings you CLASS OF 2000, a look at the problems and issues confronting today's high school students. CBS News Productions is offering a home video of the project. Click here for the details. Want to link to CBS? Now you can use the official CBS Eye on the Net Link Icon to send web surfers our way. Please feel free to copy it and use it on your pages when linking back to us. Thanks for the link! We want to hear from you, so please send your comments and questions via e-mail to [email protected]. 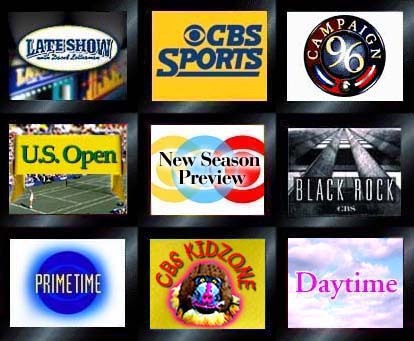 CBS "eye device" is a registered trademark of CBS Inc.